Perfect for any party or occasion, this no-bake taco dip is SO easy-to-make, delicious, and sure to be a crowd pleaser! 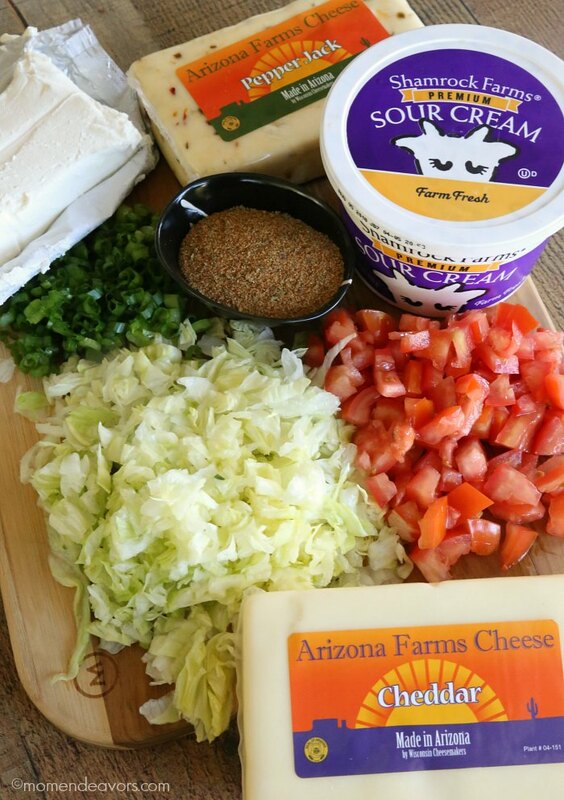 Read on for the easy recipe and dip directions – thanks to Shamrock Farms and Arizona Milk Producers for sponsoring this post. It just isn’t a party without a good dip, am I right?! 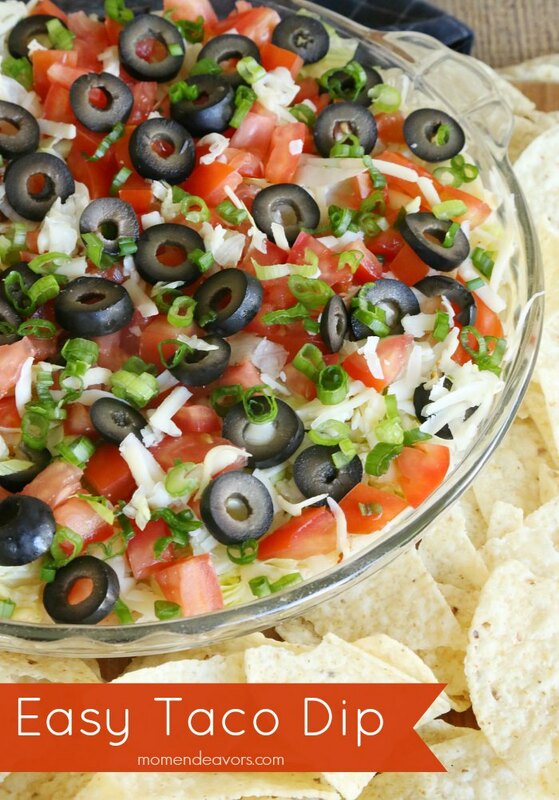 We love a good dip recipe and taco dip ranks up right up there! Not only is it delish, but it is SO easy to make! Really, it’s good for any occasion, but I especially love it in the summertime because there is absolutely no cooking or heating involved for this one! So it’s perfect for whipping up before heading out to the pool with friends (and we do A LOT of that here in the sunny Arizona desert)! Yum!! Doesn’t it look tasty?! That particular batch was demolished VERY quickly by 4 adults and 5 kids! So, be prepared to have no leftovers of this one! It’s THAT good! Not only is the recipe no-bake, but you can really use whatever taco toppings you like once you put together your base layer! So, it’s a fully customizable dish! For your base layer, you’ll need cream cheese, sour cream, and taco seasoning. You can use a store-bought taco seasoning packet or opt for your own homemade taco seasoning. You just mix the cream cheese together with the sour cream and taco seasoning – ideally using a hand mixer or some strong hand stirring action on your part to really get things smooth and creamy. It helps if the cream cheese starts closer to room temperature! Now I realize that base layer doesn’t look super appetizing on its own, but I promise it’s delicious! For things like this we love using Shamrock Farms products as they’re made with with pure, wholesome milk containing no added growth hormones. They’re a local company for us (Arizona family-owned) and we love supporting local! You can even take a tour of their working dairy farm here (during October – May). 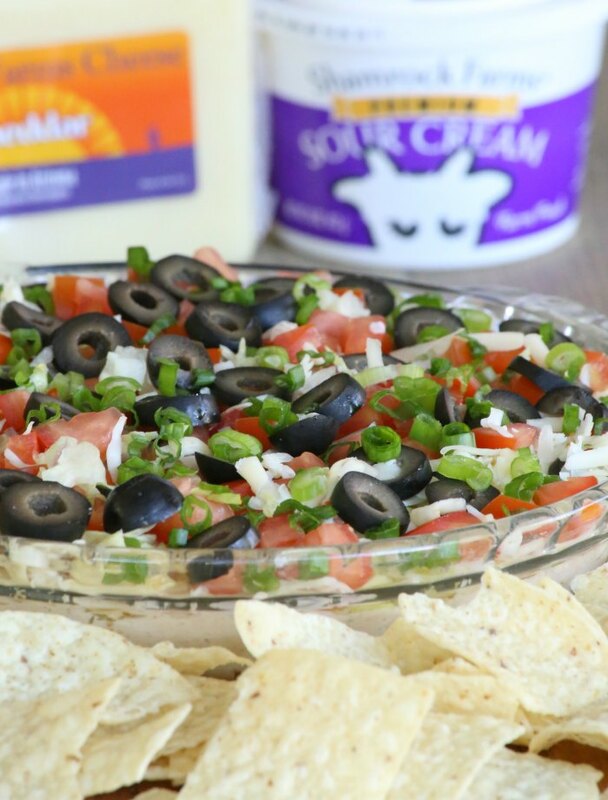 Their sour cream is perfectly smooth and creamy, so it was the perfect base for the dip! You’ll spread that base layer into a serving dish and top with your favorite taco toppings. I usually opt for “classics” like shredded lettuce, diced tomatoes, and sliced olives, but you can really do whatever you like! Just don’t forget the shredded cheese!!! Cheeeeeese! 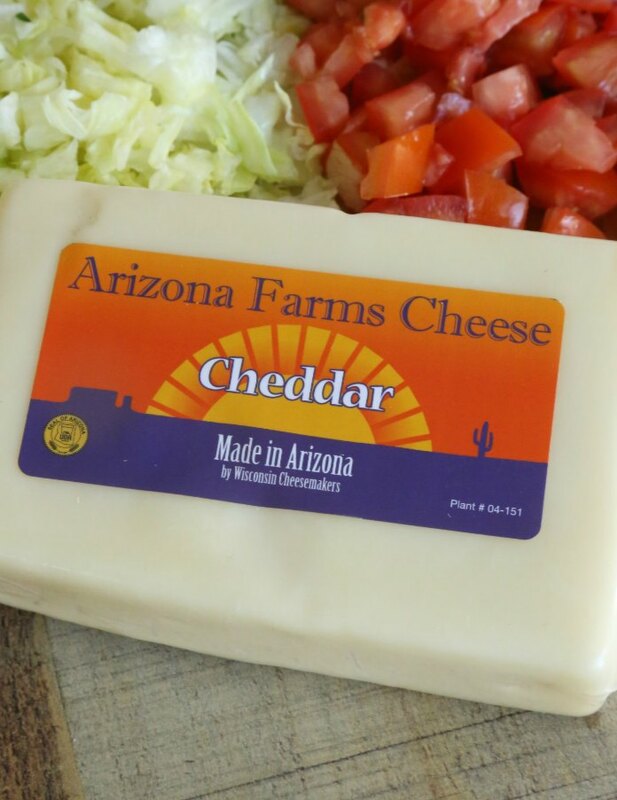 Thanks to our June Dairy Month partnership with the Arizona Milk Producers, we had some of this delicious Arizona Farms Cheddar Cheese to use. I love that with the Arizona Milk Producers they produce only high-quality milk from healthy well cared for cows. Plus, there’s no added hormones and the products are antibiotic free! That makes for even better cheese! And, it’s perfect for shredding! I like shredding my own anyway – especially in dishes like this as it has such a better texture when you do it yourself. Cheddar is my go-to cheese for this dip, along with some Pepper Jack for a little kick. But, just like the other toppings, you really can use any cheese you like! Super easy and super delicious! 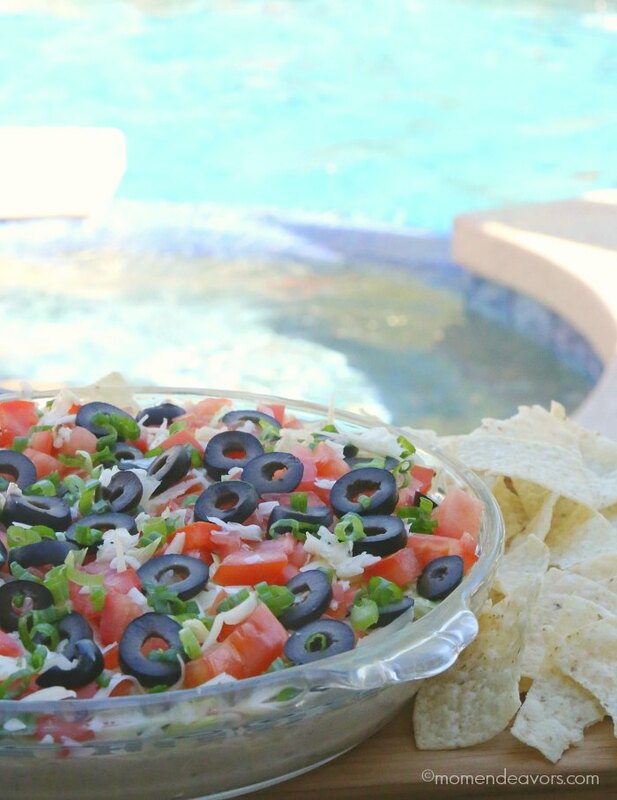 Really, it may be our favorite cold dip! If you need a good, creamy hot dip recipe though, you’ll have to try our loaded baked potato dip. That one is DIVINE too…but I prefer this taco dip in the summer! Anything to not heat up the house when it’s blazing hot out! Perfect for any party or occasion, this no-bake taco dip is SO easy-to-make, delicious, and sure to be a crowd pleaser! In a small bowl, combine softened cream cheese, sour cream, and taco seasoning mix. Use a hand mixer or stir vigorously to mix well and give nice consistency. Spread mixture evenly across the bottom of a serving dish (I like to use a large pie dish). Top mixture with shredded lettuce and 1 cup of shredded cheese. Then sprinkle on tomatoes, olives, green onions, the rest of the cheese (and any other desired toppings). You can make the base cream cheese mixture the night before to let the flavors really blend if desired. Just don't put the toppings on until ready to serve/transport to avoid things getting soggy. You can add (or omit) to the toppings list above with any of your favorite taco toppings. Additional tasty ideas include sliced jalapeños, chopped avocado, black beans, etc. YUMMMMmmm! This is sure to be a hit for any of your upcoming gathering! So, be sure to pin this recipe and then head to the store to pick up your ingredients! And in celebration of Dairy Month, we have an AWESOME giveaway from Shamrock Farms and Arizona Milk Producers to help you stock up at the store to make this and your other favorite dairy-filled recipes! Enter via the giveaway widget below through July 9, 2018(open to US residents, 18+). GOOD LUCK! Disclosure: This is a sponsored conversation written by me on behalf of Shamrock Farms and Arizona Milk Producers. The opinions and text are all mine. Yum! This recipe was amazing. Crisp and cool- so perfect for a hot summer’s day. I love taco dip at parties in the summer, its a great dish. My husband and I both like taco dip and this looks delicious. Any taco dip is a must have.. especially this colourful one. Seven layer dip is nice, also with guac. I love taco dip with plenty of jalapeños and extra cheese! I’ve never had taco dip, but now I kinda feel like I need it! I like taco dip with chorizo and hot peppers. This looks perfect for the 4th especially since I don’t want to turn the stove on in this heat! We LOVE Taco Dips, and yours looks delicious! I usually also add guacamole and serve some jalapenos on the side. i’d love to try this! looks great! I have bookmarked this recipe to make as soon as possible. I love serving taco dip with homemade garlic pita chips! I serve it as an appetizer. I love the sound of your taco dip recipe! I would also add guacamole!! I like taco dip with tons pf hot peppers. I love taco dip with tortilla chips! YUM! I like taco dip with tortilla chips. Yum! I have to have a spicy element in my taco dip! It’s my favorite dip of all time. I like my taco dip spicy and with avocado — served with Tostitos! You can never go wrong with avocado, refried bean and sour cream taco dip! I like taco dip with refried beans. I like taco dip with lots of cheese on top. This looks so yummy! I tend to make my dips with some ground beef, but the olives look really good in this. I like Taco dip with extra cheese, jalapenos and refried beans. I love taco dips with avocados. Your recipe sounds so yummy! I like taco dip with blue tortilla chips. I don’t really like sour cream or cream cheese, so I would probably leave both out. Usually when they are mixed in with something else, you can’t even tell they are in there, so I probably would eat it anyway! I grew up in Texas, so I am content with just a jar of salsa and a bag of chips. 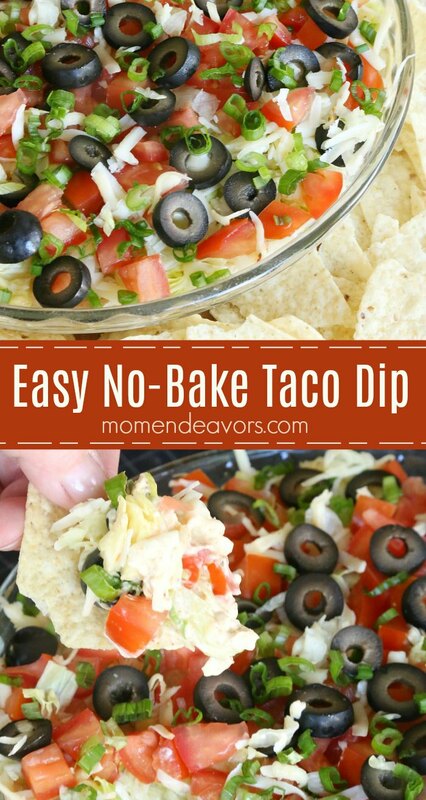 I have only had taco dip once but this recepie I think I am going to try this. It sounds so good. I’m from Wisconsin, and I love anything with cheese! This taco dip with cream cheese looks like a real crowd pleaser! I think it would be great to take to a potluck at church! This looks amazing! I love quac, refried beans,sour cream, cheddar and salsa. Tortilla chips go great with taco dip. We love a cheesy taco dip, smothered with sour cream and melted cheese. I’ve never done it this way but it looks amazing! I love a good seven layer dip! My favorite dairy recipe is cherry cheese pie. Taco dips is really good-you get the best of all worlds. I love adding sour cream and onions to my taco dip! I have had this dip before and it is so good. I like it cold with hot chips. I like a warmed taco dip and it has to be spicy! I’m super lazy because I really love the 8 layer taco dip from Costco. It’s so delicious and has been a huge pregnancy craving! I like to spread taco dip over pasta – it’s great! Taco dip is one of my favorites with a huge bag of nacho chips. Even better when they are freshones made at the farmers market. Love Taco Dip! Without the lettuce and add cilantro. I love taco dip with lots of cheese. I had never heard a taco dip before. Sounds a little similar to a seven layer dip I usually make. Sounds like a great addition to any summer barbecue. I like spicy and cheesy taco dip. I like taco dip with an extra kick, so I would include jalepenos. I love a good taco or layered dip. So easy to throw together, even when you’re trying to stay light on carbs. I like to have taco dip with nacho chips. I like avocado in my taco dip. Hubby and I like lots of jalapenos in our taco dip. I like adding in jalapenos and hot sauce. I like my taco dip with a lot of tomatoes! My favorite dairy recipe is a pudding pie. i admit sometimes i eat taco dip with a spoon. is that wrong? I have always been a fan of taco’s especially made at home. I love sour cream with chives that is my favorite dip! I like to make 7 layer dip. I really love that this is no bake! Perfect for when there is literally no time to bake! I love to also make a cheese and beef sauce recipe. Perfect for nachos or topping anything! I love taco dip with pita chips and bread. I love taco dip with added cooked hamburger meat and corn chips for dipping! YUM! This dip looks really good. I usually buy a 5 layer dip. I like Taco Dip with tortilla chips. This one looks yummy! I love taco dip with lots of guacamole added to the top. Another favorite dairy type recipe is a dry JELL-O mixed with Cottage Cheese and Fruit Salad. I like like taco dip with avocados and with lots of sour cream. This Taco Dip recipe sounds amazing. I will have to try it out at my next fiesta. 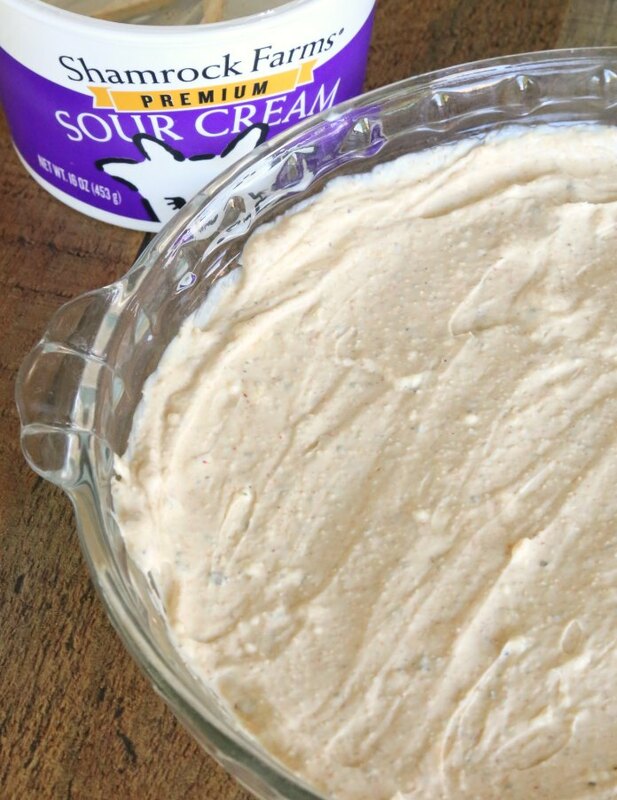 One of my favorite dairy recipes is Hatch Chile Cream Cheese Dip. A crowd favorite. 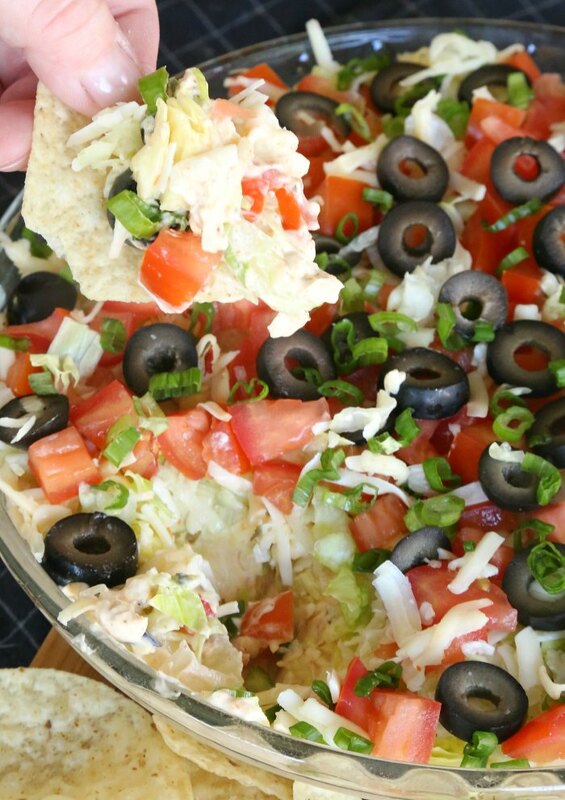 I love my taco dip with lots of shredded lettuce and of course black olives! This taco dip looks SO GOOD – the use of cream cheese in this recipe has me drooling. I’ll definitely have to try it!! Other dairy recipes I love making include cheesecakes of all kinds, as well as homemade Greek yogurt!